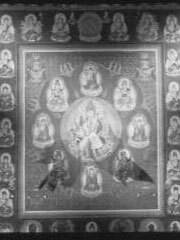 In Vajrayana Buddhism, the Womb Realm (Skt. garbhakosa-dhatu, Jp. 胎蔵界 taizōkai) is the metaphysical space inhabited by the Five Wisdom Kings. The Womb Realm is based on the Mahavairocana Sutra. The Womb Realm is a very popular subject for mandalas, and along with the Diamond Realm (vajradhatu) Mandala forms the Mandala of the Two Realms. including the initiation or abhiseka ritual. In this ritual, new initiates are blindfolded and asked to toss a flower upon a mandala. Where the flower lands helps decide which Buddhist figure the student should devote themselves to. In traditional Shingon halls, the Womb Realm Mandala is hung on the east wall, symbolizing the young stage of Mahāvairocana Buddha. In this setting, the Diamond Realm Mandala is hung on the west wall symbolizing the final realization of Mahāvairocana Buddha.